It's a magical day when an ordinary girl becomes a princess. In the aftermath of the terrible tragedies and sad stories from this week's hurricanes in Alabama, the dismal economic outlook, and other sad news that we see every day, the royal wedding is a reminder that fairy tales can come true, and that life is a celebration! I'm glued to the television to watch the Royal Wedding and will certainly watch this wedding many, many times this weekend. As I watch the coverage this morning, two moments stand out in my mind right now. 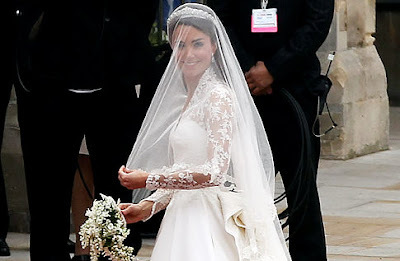 Kate Middleton's wedding dress designed by Sarah Burton is so exquisite. 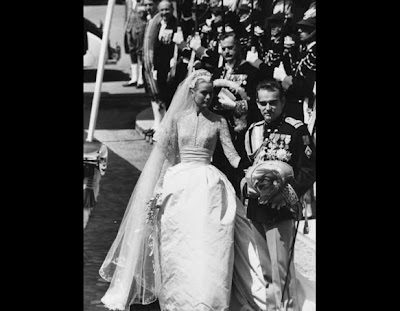 The long lace sleeves and conservative cut are stunning and channel one of my favorite style icons, Grace Kelly. Maybe Lady Gaga designed these royal ensembles, but I had to do a double take at these outfits. My minnies disapproved and Princess Natalia said that they looked like the Evil Stepsisters. You be the judge. I thought the SAME EXACT thing about Sarah's daughters! Really! Horrible!!! that is too funny... I agree about the sisters comment! as for her dress... gosh it was so exquisite! I could not agree more with the comment about the "step sisters"! Kate, on the other hand, was stunning! Oh my gosh they look like clowns!!! It's amazing how some people never think to look in the mirror. Kate was stunning and I love her dress. She looked like a bride should look....elegant and beautiful. I think too many brides these days show too much at their weddings. Kate proved that you can cover up and still look fabulous! Perfection! Kate was stunning and William so dashing - they are such a wonderful couple! Yep, I was quite alarmed at the sight of the princess cousins. What was going on there??? Haha I love your daughters' comments! They really did look a little sinister! I agree she was beautiful! The minnies nailed it on the head about the two Princesses. I don't know where they found those outfits. I had to laugh at the 'evil stepsisters' comment! Your daughters speak the truth, darling! My 88 year old grandmother made the same comment - about the girls looking like Lady Gaga!